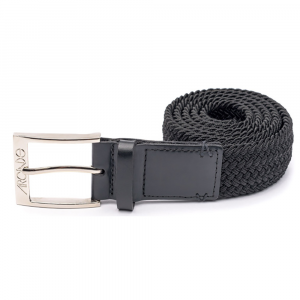 See the forest for the trees with this adventure-ready Arcade Belts Blackwood belt. It is designed to move and stretch with you, whether you're hiking, paddling, skating, climbing or just hanging out. The ultimate go-anywhere, do-anything belt, the Arcade Belts Don Carlos belt is designed to move and stretch with you, whether you're hiking, paddling, skating, climbing or just hanging out. Let your love of the woods shine when you wear this adventure-ready Arcade Belts Rambler Mountain belt. It's perfect for dawn patrol, all-day sessions at the crag and evening river floats. With stretchy webbing and a new micro-adjust buckle, the Arcade Belts Foundation belt is designed to move with during all your active adventures, whether you're hiking, climbing or skiing. The only tech web belt built with stretch, the Arcade Belts Guide belt cranks rugged utility up to new heights with reinforced stitching. It's ready for workwear and adventures of all kinds. Made with weatherproof materials to withstand the elements, the Arcade Belts Midnighter is designed to be comfortable during any active adventure. Made with weatherproof materials to withstand the elements, the Arcade Belts Midnighter Slim is a thinner belt designed to be comfortable during any active adventure. Designed to stretch and move with you during any activity, the Arcade Belts Nomad belt comes with built-in loops that let you clip on a 'biner (sold separately), keys or other tools or trinkets. Let your love of the forest shine front and center with this Arcade Belts Rambler Jonas belt. The perfect road trip companion, it stretches and moves with you during any activity. Let your love of the mountains shine front and center with this Arcade Belts Rambler Mountain belt. The perfect road trip companion, it stretches and moves with you during any activity.